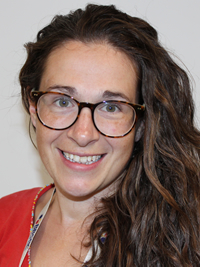 Dr Melanie Collins, International Coordinator and Strategy Manager for the Global Food Security Programme and Chair of School Governors, explores the role schools have in tackling future food security challenges. The conversations about food in schools and childhood obesity have been going on for a long time – it’s been over 10 years since Jamie Oliver began his well-known ‘Feed Me Better’ campaign. Despite seeing significant changes to the importance of school food provision over the past decade – including changes to statutory and non-statutory guidance and numerous initiatives – the challenge of obesity continues globally. Recent figures tell us that 1 in 5 children in reception are overweight or obese, and this increases to 1 in 3 by year 6. Although this statistic alone is shocking and surely an impetus to change, it is a small part of the food system challenges that our children will face during their lifetimes. A child currently in Year 2 at school (currently aged 6-7) will turn 18 in 2030 – and given how often we talk about how the world will look in 2030 and 2050 – this period will represent this child’s early adulthood. By the time our 6-year-old is 30, the world population is expected to reach 8.5 billion by 2030, with a significant increase in the global middle class and people living in cities. Trends tell us that as the global middle class increases, our diets will change – we will eat more, and proportionately more meat and dairy. Projections also tell us in the next 50 years, the world will demand more food than we have ever produced in human history. These changes will put both our health and the environment under stress. We estimate that by 2025, the cost of diabetes will be 4-5% of global GDP. We will need more water, more cropland, the loss of more forest and more emissions of greenhouse gasses. Agriculture already uses 70% of freshwater and there is no new land for agriculture – and although we can grow more using less, this won’t be enough. Our expectations about the food choices we have are going to need to change because our current food behaviour is simply not sustainable. Within the Global Food Security Programme, we define ‘Food Security’ as the point at which ‘all people are able to access enough safe and nutritious food to meet their requirements for a healthy life, in ways the planet can sustain into the future’. This future is one in which our 6-year old will live, shop, cook, eat – and one we need to be preparing them for now. 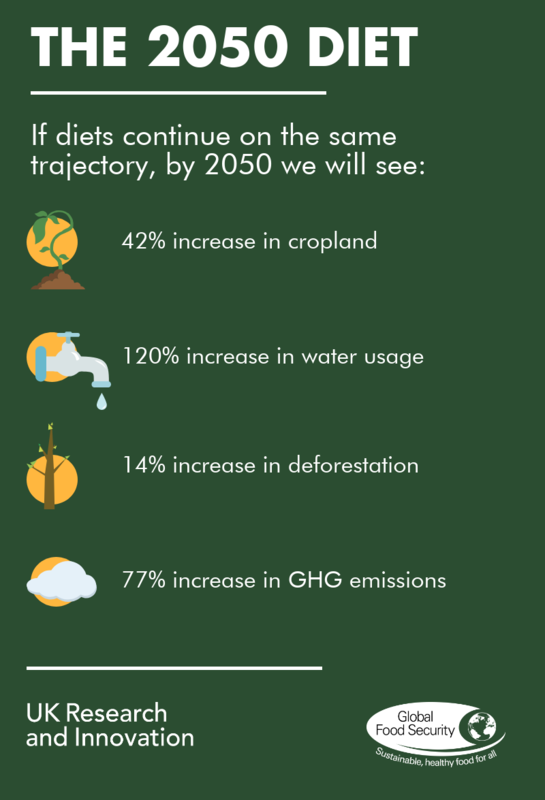 The 2050 diet – if diets continue on the same trajectory, by 2050 we will see: 42% increase in cropland; 120% increase in water usage; 14% increase in deforestation; 77% increase in GHG emissions. In view of this, the GFS programme has previously carried out activities with schools, including developing school resources and running competitions for school children to increase the understanding of the food security challenge. An important part of a school’s role is to educate children so that they are equipped to live healthy and happy adult lives – and a part of this includes the recognition that children starting school today will live in a world where their food system looks considerably different to the one we are used to. We have already seen examples of effective whole-school food policies, where food is embedded throughout all aspects of school life, and it is clear this approach works. This is why, as part of my voluntary role as Chair of Governors, I am creating a whole school food policy. The school’s leaders and kitchen staff feel that there is great value in creating a policy that goes beyond the dining hall and reflects the value the school places on food – and it is important for this policy and its implementation to reflect the fact food is about far more than the nutrition it provides. I have envisaged taking this further and creating a whole-system, whole-school food policy, reflecting the interconnected nature of our food system, with a core aim of making the school an environment where all of the choices children are presented with are healthy and environmentally sustainable – where children are encouraged to engage with their food. Weaving the school’s food values into its core vision and ethos will enable all school staff to creatively build an increased awareness of food into their activities, and for the curriculum to be designed with food and its pivotal role in our wellbeing at its core. A teacher could, for example, link a story about a meal to a discussion about its constituent ingredients and where they come from. Where has the food come from? How was it grown? Is it processed? 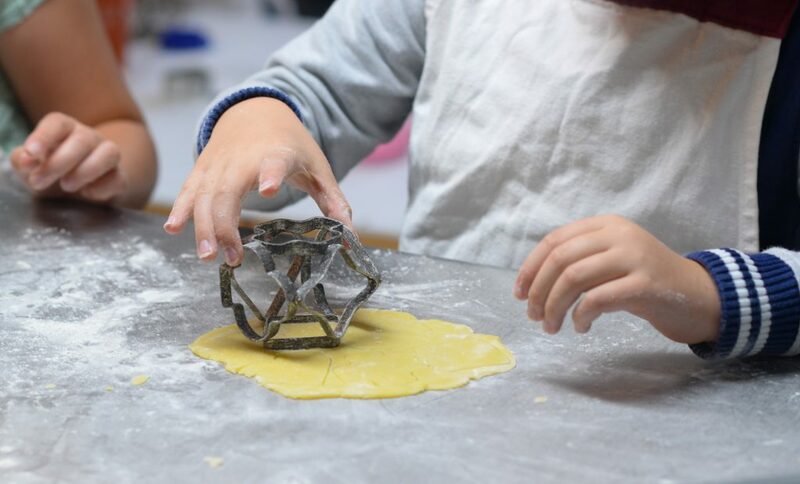 Perhaps they could cook the meal themselves, and through doing this, talk with descriptive language about the sensory aspects of the ingredients and exploring the way they feel and behave – building aspects of literacy, numeracy and science around food – a central part of our lives. It will clearly set out the links between food and wellbeing, and the role a healthy diet plays in a child’s ability to learn. This holistic approach would encompass the food provided, how it is sourced, the educational role of lunchtime, and embedding the teaching of food and nutrition into the school’s curriculum. Developing an increased understanding of food and its place in the world, and a desire to question and think critically about the food system, could be a powerful tool to help drive the behaviour change needed to move to a food system that provides enough safe and nutritious food for everyone to meet their requirements for a healthy life, in ways the planet can sustain into the future. A whole-school food policy is crucial in setting out what will be done and how it links to the school’s overarching vision and values – however the implementation of the policy will be the driver of change. We need to ensure the work reflects the voices and values of the school community, and that it doesn’t generate additional work for school staff. In order to achieve this, we will be creating a School Food Committee, which will be governor-chaired, with membership from the school kitchen staff, other school staff, pupils and parents. Within GFS, one of our strengths is our partnerships, and I am keen to use this strength to amplify this work. I believe working with school leaders to build a whole-school approach to food has the potential to drive the changes we need to move to a food system that provides food security for all. Very helpful, all Governing Bodies should be thinking in these terms. We need to “Act Now”! Thank you James – I agree. I think we hear a lot about the need to think further into the future as Governing Bodies and I believe that reflecting on the global challenges that today’s children will face in their lifetimes as a useful reminder of why this level of forward-thinking is needed. I hope that this framing provides a useful ‘how’ to the ‘why’.